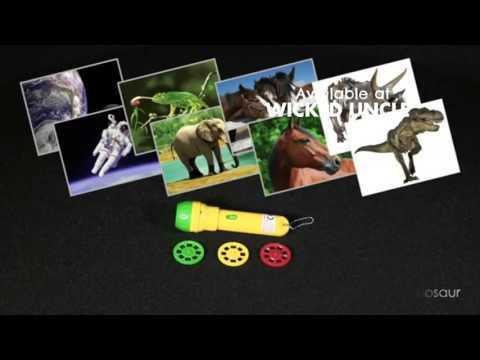 This fantastic projector torch projects amazing images of dinosaurs around your room. View cool dino images on your walls and ceilings including Tyrannosaurus Rex, Velociraptor, Triceratops and more. Perfect for smaller hands, the 11cm long torch comes with three slide discs with 24 colour Dinosaur photographs, with images that project up to one metre wide. Can also be used as a normal torch without the slides in place. Ideal for camping or sleepovers and great fun at bedtime! Projects images of animal wildlife around your room. Toys for four year old boys are all about fun. They appreciate cool stuff to make and create and it keeps them out of mischief. Scary dinosaurs, robots and outer space are very popular with this age group, along with toolkits and balls to kick into next door’s garden.